One of the more enjoyable Christmas traditions is to replant a living Christmas tree into your landscape after the holiday season. Living trees are usually purchased as containerized trees grown in pots or as "balled and burlapped" (B&B) trees. These have large field-dug root balls bundled in burlap or other fabric. 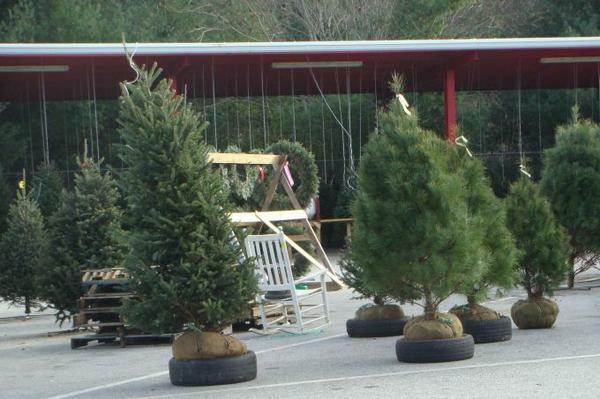 Containerized trees are usually smaller and target the “tabletop” Christmas tree market. Following use as Christmas trees, either type can be planted into the landscape. Unfortunately, Christmas trees replanted after holiday use often do not survive or grow well. Most problems can be traced to several factors. The tree species purchased may not be adapted to the climate where the tree is planted. Often larger trees are purchased for in-house display that suffer a greater degree of transplant shock than smaller trees incur when planted. Very often while in the home, a live Christmas tree is allowed to dry out between watering. Even one episode of excessive drying can stress a tree to the point where it cannot recover. Finally, a Christmas tree is often displayed in the home too long. After little more than a week, a tree can it loses its winter hardiness after which it succumbs to freezing temperatures when planted outdoors. However, with proper care, watering, and a little luck, living Christmas trees have transitioned to the landscape and survived. Once established, they can often be enjoyed for years to come. Balled and burlapped Fraser fir and white pine at the Farmer's Market in Asheville, NC. Though very popular as a cut Christmas tree, Fraser fir is not recommended as a living Christmas tree to be planted in the landscape. Fraser fir grows naturally in fertile soils at elevations of 4,500 feet and above and is typically cultivated at elevations above 2,500 feet. Fraser fir will not usually survive more than a few years if planted at lower elevations. High summer temperatures and drought stress impede normal growth. Fraser fir incurs increased problems with pests at lower elevations. In western North Carolina where it is grown as a Christmas tree, Fraser fir has problems with balsam woolly adelgid. If the trees are not killed outright, they are left disfigured and an eyesore. Heavy clay soils lead to further difficulties in establishing Fraser fir. Fraser fir often does not transplant well because of its poor rooting habits. Of the firs grown in western North Carolina, Canaan fir transplants much better and looks much like a Fraser fir. White pines are also limited in their recommended range in NC. Better white pine growth may be expected at elevations between 1,200 to 3,000 feet on cooler, north-facing slopes, in coves, and along stream bottoms. As with Fraser fir, white pine has a limited life expectancy if planted in the lower Piedmont and Coastal Plain, especially on clay soils. The spruces may survive many years when planted out of their natural range, but often lack normal vigor and growth. Norway spruce usually performs better than the other spruces when planted on marginal sites. The firs, spruces, and white pine will all perform best when planted in a cool area out of strong winds. The site should have sufficient moisture, but it should not stay wet for prolonged periods. Also consider that these trees grow very large. If they live for many years, they will require room to grow. Leyland cypress, Arizona cypress, Virginia pine and eastern redcedar are all suitable for the Piedmont and Coastal Plain areas of North Carolina. These species are adapted to a wide variety of sites and tolerate warmer climates. Each of these species can have their own set of pest problems, but can often be grown problem-free in good locations. However, they require more shaping than the "mountain" species to retain their Christmas tree appearance. In addition, small, containerized ornamental conifers are available at many retail stores. These tabletop Christmas trees can be various species including dwarf Alberta spruce, Norfolk Island pine, Italian stone pine, false cypress also known as Lawson or Port-Orford cedar, and even rosemary (which is not a conifer but an herb). Some of these can be planted in North Carolina and others can’t. Be sure to read the tag that accompanies the plant to look for further information, especially the planting zone. If the trees were grown in a greenhouse, they may lack any winter hardiness at all. Such plants will need to be kept inside or in a protected place until spring when the danger of frost is over. Due to small container size and the coarseness of the often root-bound media, these trees can be especially difficult to keep watered and alive for outdoor planting. Trees destined for the landscape should be no larger than five to six feet in height. This provides a sufficient root ball for survival and easier handling. Minimum standards recommended by the American Landscape and Nursery Association suggest that a 5 foot pyramidal conifer should have 22 inch diameter root ball to survive transplanting. Smaller root balls will not provide adequate moisture uptake to sustain the crown of a typical Christmas tree. Once selected, Christmas trees must be properly maintained. Trees should be placed in a cool spot in the house, away from heat or direct sunlight. LED or small, low-temperature electric lights should be used for decoration rather than any older-style, heat-generating incandescent bulbs. By reducing home thermostat settings a few degrees (especially when the room is not occupied), you can also slow the rate of drying and stress on your tree. Both B&B and container trees need to be watered regularly but not flooded with water. If a deep tub is used to contain the B&B tree, there should only be an inch or two of water at the bottom – do not fill it to the brim like the bowl of a cut Christmas tree stand. Roots need to breath. One technique for watering living trees while they are displayed indoors is to periodically distribute crushed ice over the top of the root ball. Moisture retention of your tree can be further improved if you spray a light mist of water on the foliage (if that can be done without damaging ornaments or risking electrical shock). A full size tree can use as much as a gallon of water in a day. If you do not have an adequate water-tight container in which to place the tree, you can wrap it in heavy plastic sheeting. Center the tree on a square of plastic, wrap it from the bottom, and leave the top open to breath. You should be able to water the tree without any water reaching the floor or table. Care should be taken to never over-water any tree. Trees also have a better chance of survival if they are not displayed in the house for more than a week to ten days. Extended exposure to indoor temperatures can counteract winter dormancy in conifers. If the trees are set outside into severe cold after acclimating to indoor temperatures, they will exhibit winter injury in the form of foliage burn and bud abortion. Different storage techniques to re-acclimate trees to outdoor temperatures are marginally effective if dormancy is already broken. However, if the ground is frozen when the tree needs to be moved outside, store the tree in an unheated area such as a garage or outbuilding that is protected from the wind until it can be planted (and don’t forget to keep it watered). A short display period and prompt planting is the best way to insure a tree’s survival in the landscape. To plant, till an area four to five times the size of the root ball to a depth of six inches. Dig a planting hole the same diameter and slightly shallower than the root ball or container size. Natural burlap can be left on the ball, but remove treated burlap or nylon and of course remove the plastic container. If a containerized tree is root bound, break up or divide any coiled or massed roots on the outside of the root system. Level the surrounding soil with the top of the roots. After planting, spread two to three inches of mulch over the disturbed area. If the tree is in a windy location, tie and stake it to keep it from blowing over. Some landscapers secure the root ball rather than tying straps to the stem (a practice which frequently injures the bark). Water the tree after planting, but wait to fertilize it until spring after the tree has started to grow. Do not over fertilize in the first year, especially with nitrogen, until roots have had a chance to become well established. The above procedures only get a living Christmas tree into the landscape. Other cultural practices are necessary if the planted tree is to thrive in its new environment. These practices include soil management (mulching, irrigation, fertilization, etc. ), insect and disease management (identification, treatment decisions, and control), and periodic shaping to maintain the "Christmas tree" look. A homeowner must be willing to invest in ongoing maintenance to keep their tree beautiful. However, individuals who are successful can point with pride at their efforts, which will always remind them of the holiday season when the tree was planted.